Use the following tips on how to play volleyball defense. These are important methods for blocking at the net and strategies for digging. The following are key skills for honing your awareness and playing effective defense. 1. Visual Recognition. Each player on the court should recognize who the front row and back row players are. Its a big advantage to know who is front row because you need to know what players could possibly attack the ball at the net. Also, you need to know where the setter is. For example, do you pay attention to whether or not the setter is front row or back row? If the setter is back row, the setter cant attack at the net. If the setter is back row, you have 3 attackers that can attack at the net. When the setter is front row, there are only 2 other attackers on the front row to worry about. If the setter is front row, its important to determine whether the setter is more interested in setting attackers or attacking the ball herself. For example, if the setter never attacks when they are front row, then you don't need to stay with them. Instead, you can just move with the other two attackers. Its also important to understand the rules for attacking. The following are situations where its legal for a back row setter to attack the ball. Scenario 1. The setter is in front of the attack line and dumps the ball over the net while part of the ball is below the top of the net. In this situation, as long as part of the ball is below the top of the net, the back row player can attack the ball. Many players think as long as you dont jump, you can attack the ball. This isn't true. Its not where your feet are, its where the ball is at the moment of contact. As long as part of the ball is below the top of the net when the ball leaves the players hands, then its legal. It can be smart to train your setters to dump the ball even when they are a back row player (attacking with part of the ball below the top of the net). Scenario 2. I've often seen a setter run a 5-1 offense and never attack when on the front row. I think this is a big mistake because smart teams will just ignore the front row setter and stay with the other 2 attackers. You should keep the blockers honest by having your setter dump the ball every once in awhile. Otherwise, youre just making it easier for your opponents to block and play defense. 2. Track the ball. You should follow the ball and be constantly making judgments on how youre going to be attacked. Such things as what player passes the ball or where the ball is passed will help predict where the setter is going to set. For example, a well passed ball to the target area could give the setter the option to set any of the attackers. A ball passed away from the net or towards the sideline reduces the chances of running a middle attack. With the middle attack not likely, you should be ready for the other possible attacking options such as a high outside set or a back row attack. Also, who passes the ball can help predict who the setter is likely to set. 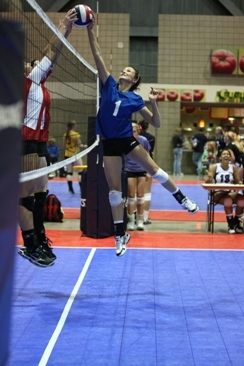 A ball passed by an outside hitter could indicate the setter wont be setting the outside hitter. If the setter does set the outside hitter that just passed the ball, the ball is almost always hit line. Becoming familiar with these game situations can make things more predictable and easier to play defense. 3. Tracking the Attackers. Its important for both the front row blockers and back row defenders to track the opposing attackers. Be aware of how your opponent likes to attack. Many teams often run the same offensive plays each time they get to that rotation. For example, when a particular player is right front, they may run an X play every time in that rotation. Its important for the front row players to communicate with teammates and identify these plays before they happen so its easier to anticipate what the blockers need to block. Its usually the middle blocker that alerts the team of what possible plays are going to be run. 4. Communication. Good communication involves being able to give, listen for, and acknowledge verbal cues. A cue can be given such as red defense or setter down. Its also important to use verbal communication during the rally. For example, the moment you see the attacker is going to tip the ball, you can yell out Tip! to alert your teammates. Its also important to call the ball when passing. For example, call mine, mine, mine! when you want to take the ball. Your team should know ahead of time what player is preferred to pass most of the balls. Most teams will have the best passers take most of the easy balls. Its important to recognize early when the easy ball is coming. In this situation, the best passers should call the ball early. 5. Using Good Technique. There are specific movements to use to make it easier to get in position to make plays. Improve your movement skills to help get in correct position and control the ball. If you get caught out of position, it will be difficult to make the play. The best teams have the best fundamental skills. The better your technique, the easier it is to get in position to make the play. The better you are at getting in position, the better you'll play defense. Volleyball slide tips and techniques for spiking. Tips hitting slides, approaches, and blocking the slide.